Illinois Workers' Compensation Law provides an up-to-date, accurate assessment of Illinois workers' compensation law in a practical, easy-to-use format. 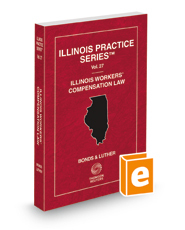 It contains a summary of historical developments of the Illinois Workers' Compensation Act that helps put the law into perspective. The text also provides appendixes containing current acts, statistical tables, and tables of abbreviations useful for developing a case.